Game 1 featured Kevin Millwood on the hill versus CC Sabathia. I didn't anticipate the Mariners getting a win in this game unless CC was absolutely horrible and honestly, how often does that happen? The Mariners had only one hit through most of the game and that was on a Casper Wells homerun. Miguel Olivo had a double late in the game, but the Mariners were already down 6 to 1 before getting 2 runs in the ninth on a Dustin Ackley homer. The final score, 6 to 3 in favor of the Yankees as the M's struggled to only get 3 hits on the day. 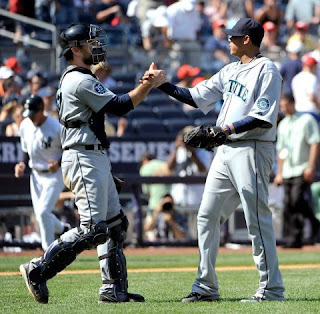 Game 2 was a match up that favored the Mariners as Felix Hernandez was on the mound throwing against Hiroki Kuroda. The Mariners scored first in the 2nd inning on a Mike Carp RBI single and Felix was pitching with a 1 run lead. That lasted through the 3rd, 4th, 5th and so on as King Felix was dominating the Yankee hitters. Felix gave up just 2 hits and pitched a complete game shutout as the M's lone run in the 2nd inning held up to give them the win. Felix was brilliant in New York once again and he dropped his ERA down to 2.63 on the season. Game 3 was a giant question mark for me as Hisashi Iwakuma was starting for Seattle against Freddy Garcia. Garcia has been pretty solid and after Iwakuma's last performance against the Blue Jays I thought he just may come out and shut down the Yankees and send us to a series win. That was not the case as Iwakuma struggled most of the day and was sent out after just 5 innings being down 4 - 2. The Mariners only 2 runs came off the bat of Jesus Montero who got an RBI in the 1st and the 5th innings. The Mariners were done in as they only scratched out 5 hits and struggled the entire weekend to get their bats going at all. Not the series that I anticipated coming off of our recent home stand and heading to a hitter friendly Yankee Stadium. Now it's off to Baltimore to try our luck versus the Orioles. Hopefully we can be a lot more productive and we can see the Mariners get back to another winning streak. At least winning the series would be nice. GO MARINERS!